Last day of Dine Out Edinburgh! Join us for a two week celebration of Edinburgh restaurants. Dine Out Edinburgh lets you dine in the best restaurants in Edinburgh for just £15.95. 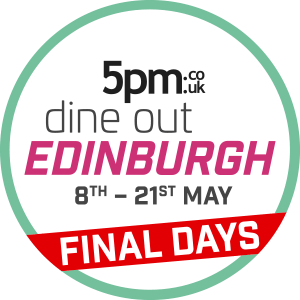 From 8th May to 21st May, over 30 restaurants are taking part in Dine Out Edinburgh and offering two or three courses, sometimes including a drink, for only £15.95. You can book online and search through menus and user reviews to find the dining experience that best suits you. Dine Out Edinburgh allows locals and visitors to the city to participate in Edinburgh’s thriving restaurant scene, without breaking the bank. From Michelin stars to Italian restaurants to street food pop ups, Edinburgh has one of the most exciting dining scenes in the UK. With participating restaurants in the cobbled streets of the Old Town, the wide Georgian streets of the New Town, the West End’s Theatre district and the stylish dockside of Leith, Dine out Edinburgh covers every corner of the capital. 5pm.co.uk features offers at Edinburgh restaurants all year round, but Dine Out Edinburgh gives diners even better value with special offers for just £15.95. If there’s a restaurant in Edinburgh you’ve been meaning to try, now is the time.